While I hope I stay humble, it's also encouraging -- and exciting! -- to be recognized for the hours I spent at this desk. In this year's writing awards from the Automobile Journalists Association of Canada (AJAC), I won Journalist of the Year presented by Jaguar Land Rover Canada, and the CAA Road Safety Award. My thanks to both for their sponsorship, and also to the winners of all the other categories presented during the ceremony. My editor at the National Post had something to say about it ... go have a look. What does it take to be the Canadian Car of the Year? Each year, the Automobile Journalists Association of Canada hands out its Canadian Car of the Year and Canadian Utility Vehicle (or Truck) of the Year awards (as well as Canadian Green Car of the Year, Canadian Green Utility Vehicle of the Year, and Best New Technology awards). But how does it pick a winner? It isn't simply a case of sitting down and comparing notes, but of writers from across Canada meeting at a central location for four days, and driving all of the competitors back-to-back on the same routes. Find out how it's done in my story over at Autofocus. Once again, the Ram half-ton with diesel engine has taken the top spot in the Canadian Truck King Challenge, an event organized by auto writer Howard Elmer (at left). Award winners also included the Mercedes-Benz Metris and GMC Canyon. Find out more in my story over at the Toronto Star. Canadian Car of the Year Awards: Here are the trucks! As a member of the Automobile Journalists Association of Canada, I'm also one of the many judges for the Canadian Car of the Year and Canadian Utility Vehicle (or Truck) of the Year Awards. For the Toronto Star, I had to rate what I think will win in the pickup truck category. We won't know for sure until November 24, but here's how I think it will go. I will throw modesty aside for a moment, and say thank you to CAA for giving me the 2013 Road Safety Journalism Award for a piece I did on child seats. 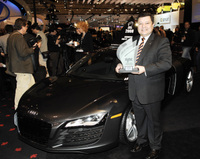 It was handed out at the annual Automobile Journalists Association of Canada (AJAC) awards banquet last week. I'm very thrilled and honored to have won. Here's the scoop. And here's the story that won. Ford takes the Women's World Car of the Year! The votes are in (I'm one of the judges) ... and the overall winner of the Women's World Car of the Year is the Ford Fiesta 1.0-litre EcoBoost (an engine that will be coming to Canada later this year). The category winners are the Audi Allroad for Family Car; Range Rover for Luxury Car; Porsche Boxster S for Sports Car; Mazda CX-5 for SUV; and the Fiesta took the Economy Car crown. Congratulations to the winners! The trophies will be handed out in London in December. The Canadian Truck King Challenge - watch it here! You may have seen recent ads for Chevrolet which mention that its heavy-duty Silverado won the Canadian Truck King Challenge. If you've wondered what that is, wonder no more. I was one of the judges on the event, which Motoring TV came out and filmed for a recent segment. Watch it here! That famous bulldog that adorns each Mack truck today originally started out as a block of wood, carved by a bored engineer recuperating from surgery. Find out more, and about Subaru and the original Car of the Year, in my Toronto Star trivia column by clicking here. I've just come back from a week at "Testfest," where the Automobile Journalists Association of Canada (AJAC) tests vehicles to name the Car of the Year and Utility Vehicle of the Year winners, both in their categories - the winners already announced - and the overall champions, which will be named next February at the Toronto Auto Show. It was almost a clean sweep by the Koreans and Germans this year. Small Car Under $21,000 - The Hyundai Accent won, followed in order by the Kia Rio5, Honda Civic Sedan, Chevrolet Sonic Sedan, Nissan Versa Sedan, Fiat 500 and Scion iQ. I voted in this category and pegged the Accent. Great handling, nice engine and lots of features even though it was the least expensive in the class. Small Car Over $21,000 - Hyundai Elantra, followed by the Ford Ford Focus, Subaru Impreza and Volkswagen Beetle. I suspect the overall Car of the Year is going to come down to Accent vs. Elantra. Family Car Under $30,000 - Kia Optima, followed by the Volkswagen Passat TDI, Toyota Camry, Mazda5, Chevrolet Orlando and Chrysler 200. I drove this category and while the Optima is a sweet ride, I wouldn't hesitate to recommend any of these vehicles as candidates for test-drives. I figured the Passat would win since journalists traditionally love diesels. I also thought the Orlando would do better than it did; it's a very nice, well-done car. Family Car Over $30,000 - Kia Optima Hybrid, followed by the Hyundai Sonata Hybrid, Chevrolet Volt, Dodge Charger, Mini Countryman and Toyota Prius V. This is where you can stumble when you're faced with such wide categories: how do you compare a Dodge Charger to a Mini to a Volt? It comes down to assessing each vehicle on its merits and how well it does what it's supposed to do, but it's still very difficult. Luxury Car - Mercedes-Benz C350 4Matic, followed by the Chrysler 300C, Acura TL, Infiniti M35h, Lexus CT200h and Buick LaCrosse eAssist. Amazing how many luxury cars are now adding electric motors. Sports/Performance Under $50,000 - Hyundai Veloster, then Volkswagen Jetta GLI, Kia Optima SX, Mercedes-Benz C-Class Coupe, Honda Civic Si Coupe, Buick Regal GS and Dodge Charger SRT8. This was the shocker of the event: that the Veloster topped such high-powered hardware. It's a sporty little driver but I thought the GLI should have taken it. I also thought the Charger should have been rated much higher, especially given how many people praised its performance. Sports/Performance Over $50,000 - BMW 1 M Coupe, followed by the Porsche Cayman R, Mercedes-Benz CLS-Class, Chrysler 300 SRT8, Hyundai Genesis R-Spec and Chevrolet Camaro Convertible. The 1 M made my knees go weak when I drove it, it's that good, but from all I've read, it's only going to be made for one year in very limited quantities. Why are we testing a car that may already be sold out and never built again? Prestige Car Over $75,000 - Mercedes-Benz S-Class 350 BlueTEC, then the BMW 6 Series Cabriolet and Jaguar XKR-S. That diesel in the Mercedes could give cream a run for smoothness. I want that nasty, snarly Jaguar with all my heart and soul, though. I normally get bored pretty quickly with track driving, but I could have taken that car around it all day. SUV/CUV Under $35,000 - Dodge Journey, then the Jeep Compass and Jeep Wrangler. Yes, you read that right: Chrysler was going home with hardware no matter what. That said, the wrong vehicle took the prize. The Wrangler is the best it has ever been, with a great engine, smoother ride, great interior and same awesome off-road capability. Too many people penalized it because it's a hard-core off-roader, but that's exactly the point they didn't get. And who on earth voted for a Compass that was optioned to twenty-nine thousand dollars? SUV/CUV $35,000-$60,000 - Volkswagen Touareg TDI, followed by the Range Rover Evoque, BMW X1, Ford Explorer and Dodge Durango. I've never had a thing for the Touareg, which I find bloated and uncomfortable (Tiguan rules! ), but its engine is nice. I thought it would be the Evoque and then the X1. SUV/CUV Over $60,000 - BMW X3, then the Mercedes-Benz M-Class and Jeep Grand Cherokee SRT8. I voted in this class and felt the Jeep had it. This is why I don't bet heavily on horse races. My final guess? I think that next February, the envelope will go to the Hyundai Accent and Dodge Journey. But I've definitely been wrong before. After a week at "Testfest," the annual Canadian Car and Utility Vehicle of the Year testing, I'm back home and the mud is finally off my boots. Produced by the Automobile Journalists Association of Canada, the event pulls about 70 journalists from across Canada, who drive a variety of vehicles on public roads, along with either a closed high-speed course or off-road section, and rate them. All vehicles in a category must be driven back-to-back on the same day. At the end of the week, the category winners are named, and then we vote again to determine the overall winners in the car and utility vehicle categories. They'll be announced next February at the Canadian International Auto Show in Toronto. So what won, and what should have? I was only one vote in the process, so here's my opinion on it all. Small Car Under $21,000: Ford Fiesta, Mazda2, Scion xD, Scion xB, Volkswagen Jetta. What won: Ford Fiesta. What should have won: Mazda 2. Sportier handling, more fun to drive and better visibility, even if they are close cousins under the skin. Small Car Over $21,000: Chevrolet Cruze, Honda CR-Z, Kia Forte5, Nissan Juke, Scion tC. What won: Chevrolet Cruze. What should have won: The voters got it right. The Cruze is one heck of a car for twenty-one grand. Family Car Under $30,000: Hyundai Sonata, Suzuki Kizashi, Volkswagen Jetta TDI. What won: Volkswagen Jetta. What should have won: Hyundai was robbed. I love diesels, but the Sonata hits that sweet spot in the Canadian marketplace with both barrels. Family Car Over $30,000: Buick Regal, Mercedes-Benz E-Class Wagon, Toyota Avalon. What won: Buick Regal. What should have one: Buick deserves its trophy, although I'm always pleasantly surprised by how genuinely nice the Avalon is to drive. I can't imagine why anyone would move up to a Lexus. Luxury Car Over $50,000: Audi A8, BMW 5 Series Sedan, Cadillac CTS Coupe, Hyundai Equus, Infiniti M, Lexus IS350, Mercedes-Benz E350 BlueTec, Volvo S60. What won: BMW 5 Series. What should have won: The 5 Series was a solid choice, although I was surprised by a $64,000 car that had a button for navigation, but didn't actually have a map (apparently the iDrive buttons come as a single unit, so you don't get blank keys if you don't pony up for the nav). A few of us expected the Equus to come away a surprise winner on its price, but it tied for last place. Prestige Car Over $75,000: Audi R8 Spyder, BMW 5 Series Gran Turismo, Jaguar XJ Supercharged, Mercedes-Benz SLS AMG, Porsche 911 Turbo S. What won: Porsche 911. What should have won: The victor took it in spades. This car is incredible. The SLS turned out to be the prettiest girl at the prom who can't dance: it's drop-dead gorgeous but wobbled its way around the track. Still, I'd love to be seen in it any day of the week, and for that, it really hits its target audience. Best Sports/Performance: Cadillac CTS-V Coupe, Ford Mustang Shelby, Mercedes-Benz E550 Cabriolet. What won: Cadillac CTS-V. What should have won: I had no qualms about the winner, but I thought they were all worthy. I knew the Shelby wouldn't win because a lot of journalists simply don't appreciate raw Detroit muscle. Best New Minivan: Honda Odyssey, Toyota Sienna. What won: Toyota Sienna. What should have won: It's a minivan: who cares? That said, the better-handling Honda probably would have taken it if it hadn't been the most expensive, fully-loaded model against the value-priced base Sienna. SUV/CUV Under $35,000: Hyundai Tucson, Kia Sportage, Mitsubishi RVR. What won: Hyundai Tucson. What should have won: Kia Sportage. Better-looking and a sportier handler than its Hyundai sibling. SUV/CUV Over $50,000: Lincoln MKX, Mercedes-Benz R350 BlueTec, Porsche Cayenne, Volkswagen Touareg. What won: Volkswagen. What should have won: The right vehicle took it. That new MyLincolnTouch tiny-button-computer-screen controller is impossible to use when you're driving, and while the Cayenne is lovely, it's just too complicated and way too much money. What will win overall? I think it's going to stay domestic: I'm betting on Chevrolet Cruze for Car of the Year, and Ford Edge for Utility Vehicle of the Year. Spoilers to watch for will be Ford Fiesta and Volkswagen Touareg. The 2010 Pulitzer Prize winners for journalism have been announced, and taking the top spot for national writing is Matt Richtel of the New York Times. He won for a series of articles on distracted driving, including the dangers of cell phone use -- both hands-free and hand-held. Congratulations, Matt, and here's hoping your stories make a difference in the fight against stupidity on our roads. You can find the series by clicking here.